Preheat oven to 425 degrees. Rub sweet potato flesh lightly with vegetable oil and season with kosher salt, then place flesh side down on a parchment lined sheet tray. On same tray, place acorn squash flesh side up. Drizzle with olive oil and season with salt. Roast until tender, about 25-30 minutes. In a large stock pot or saucepan, heat about 1 T of vegetable oil over medium heat. Add onion and cook three minutes, then add garlic and Thai chilies. When sweet potato and squash are tender, remove from oven. Peel skin from sweet potato and cut in large chunks. Add to onions in pot. Scoop the flesh from the acorn squash and place in the pot with the sweet potato and onions. Add vegetable stock and cook, covered, 15 minutes at a high simmer. Using an immersion blender, puree soup until very smooth. 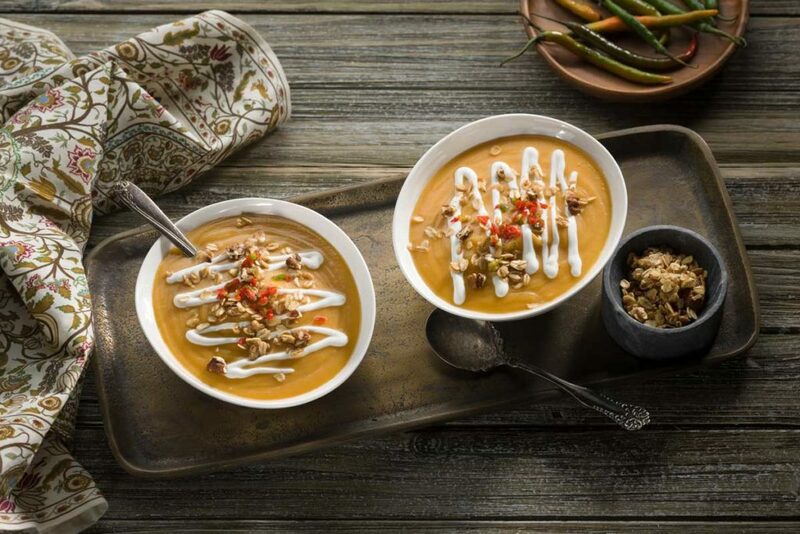 Add coconut milk and puree again, then season to taste with garam masala and kosher salt. Return to heat, simmer gently until ready to serve. 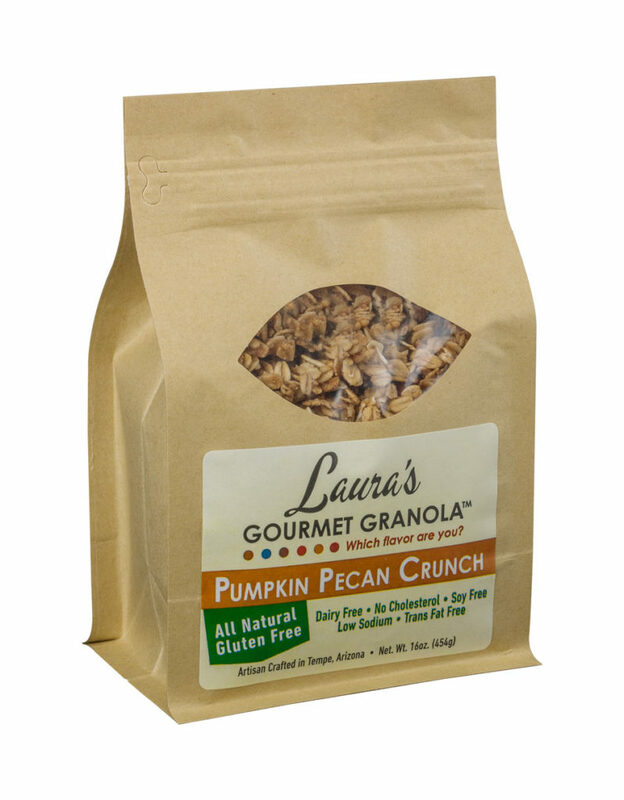 Toss Laura’s Gourmet Granola, Pumpkin Pecan Crunch, with thinly sliced Thai chilies. 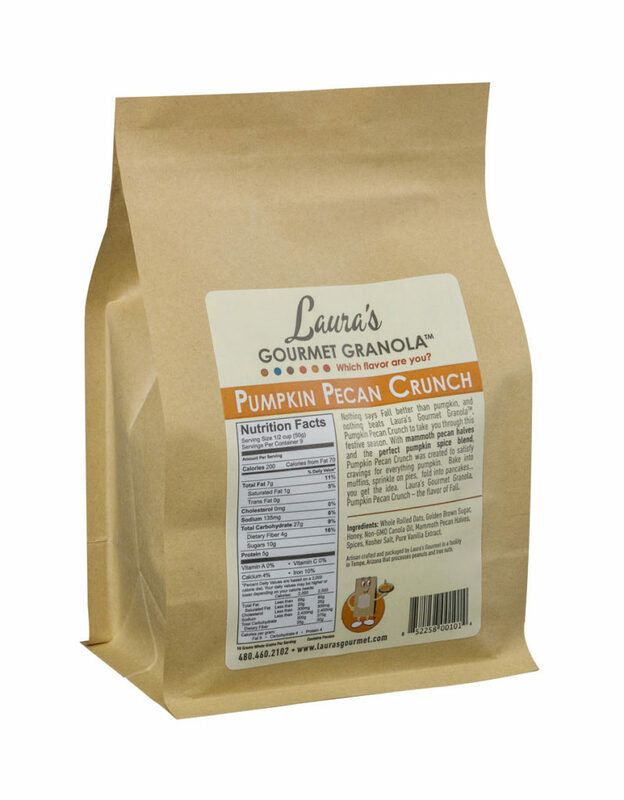 To serve, put a small dollop of the coconut cream on each bowl and “float” the granola-chili blend on top. Serve immediately.